Review: A troubled woman, still living at home and in an isolated community, finds herself pulled between the control of her oppressive family and a free spirited stranger. He opens up a whole new world for her and she begins to feels alive for the first time, failing madly in love. She starts to break away from her family and moves in with him. Things start to change when he is arrested as the key suspect in a series of brutal murders; she is left isolated and afraid. She now has to make a decision what will change her life forever. I was really impressed with this film. You could look at this film as a sort of fairy-tale film in the way that this guy comes along and tries to rescue her from her surroundings. The clever thing is that the audience doesn’t know who the title refers to, is it him or is it her or is it something or somebody else? It is great to see two new fairly unknown actors in a film like this. Hope to see much more of them both. I could see and feel the chemistry between them. 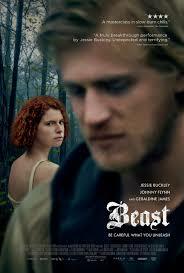 Jessie Buckley delivers the central performance and is really impressive in a very demanding role. I have not seen any work by Michael Pearce before but was really impressed with his work in this. I also thought that this was brilliantly written. Interestingly the director,Michael Pearce, previously lived in Jersey and this movie is loosely based on a real life person who was dubbed as The Beast of Jersey who terrorized the island of Jersey in the 1960s and 1970s. At the Bafta Awards in 2019 this won for Outstanding Debut by a British Writer, Director or Producer.